Can I (Partners + Addicts) Ask for THAT? This is an excellent—and frequently asked—question. Whether you’re a partner or an addict, you’ve probably struggled to make requests or ask for what you want. You don’t know what you need or want. If you do know what you need and want, you think you don’t have a right to ask for it. What you want or need feels so important to you that you think it would be unreasonable to ask for it. You’re afraid that the other person will say “no” to your request. You’re practically guaranteed NOT to get what you want or need. You lose your right to be angry with the other person for not giving you what you need or want because—after all— you didn’t ask. Even though you relinquished your right to be angry in #2, you will feel angry and resentful because you didn’t get what you wanted. There are two simple truths about requests: 1) you can ask anyone for anything, and 2) “unreasonable” is in the eye of the beholder. As a partner, you can ask the addict in your life to do something as simple as to let you know when he’s leaving his job to come home for the day, or as significant as moving the whole family to another city because you’re bombarded daily with painful reminders of his past acting out behaviors—people, places or things—in the small community where you live. Addicts regularly struggle to ask for what they want and need. The most common reasons are that you don’t know what you need, or you don’t believe you have a right to ask because you betrayed your partner. This is not only distorted thinking, but can set you up for a slip or relapse if you collect a resentment stash and use it later in a weak moment to tell yourself that you have a “right” to act out because of what you’ve been “putting up with.” Why not give yourself the right to ask now for what you need and want? You can ask your partner to speak to you in a more respectful tone, to spend more one-on-one time together away from children or electronic devices, or to engage in a community of support, for example. Or—further along in your recovery when the relationship is on more solid ground—sharing specific sexual wants and needs that you didn’t have the courage to ask for when you were in your addiction. The inability or unwillingness to have these intimate and difficult conversations can be a part of what drives addicts deeper into their addictive behaviors. A few months ago, I did a massive decluttering and organizing project at home. I had a large collection of knitting yarn that I had collected over a period of years. The retail value was more than $500. I just didn’t have a use for it any longer. Although I eventually donated it to a prayer shawl ministry at a local church, if someone had asked me, “Vicki, can I have that yarn?” I would have gladly given it to them. The request may have seemed outrageous to the person making it, but to me it would have been a relief to let it go. This is a clear example of the reality that the value we place on what we’re requesting—and giving—significantly impacts how we feel about the request. So, is there such a thing as an “unreasonable” request? I tend to think not. Unreasonable is one person’s opinion, their perception, or judgment—and almost impossible to define. And even more important, since every adult has the right to say yes, to say no, or to negotiate an alternative agreement or solution when being asked to do anything, getting into a debate about whether or not a request is “reasonable” is not a productive use of time or energy. If your partner says your request is unreasonable, they are deflecting—rather than directly addressing your request. They are entitled to their perception and they have the right to say no. You have a right to your perception, and to make a request. Are there requests you’d like to make? If there are, I hope you’ll ask. At a minimum, you will have the confident feeling that comes from standing up for your wants and needs, as well as strengthening your future ability to make requests. And who knows, you may get exactly what you want. I have expressed a desire to sell our home because of the terrible memories it holds for me related to my addict husband’s acting out behaviors. He continues to be resistant and refuses to consider it. My feelings are very strong about this, and I feel he is ignoring my needs in this respect. Can you provide guidance as to how to have a constructive conversation to clearly state my desire to no longer reside in this house? I want to avoid conflict, and I’m afraid he will refuse and I’m afraid that will mean we must separate. Thanks for your help. Hi Debbie, I hear that you have very strong feelings about selling your home and that is what I would recommend communicating to your husband, as part of the request-making process. 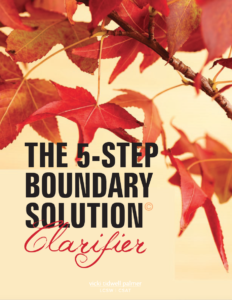 If you haven’t already, please use a 5-Step Boundary Solution Clarifier to walk through this issue and to formulate the specific request you want to make. Instructions for using the Clarifier are in my book, Moving Beyond Betrayal. If you go through (or have already gone through) this process and your husband is not willing to sell the home, then you would need to decide what his choice means for you. You have a right to make the request, and your husband also has a right to say that he is not willing to sell the home. However, that does not mean that you must stay in a situation that is not tolerable to you. This is a painful and complicated situation, and I wish for you an agreeable resolution.